This is one of the best Tanzania Safari packages. Kilimanjaro-Chimpanzee-Serengeti Safari to Mahale National Park in the shore of Lake Victoria. This fantastic and memorable tour is a journey from Tanzania’s highest mountain, across its far-reaching plains and into the heart of its jungle forests to meet some of its rarest primates inhabitants. To witness chimpanzees in their natural habitat truly is an incredible experience, one you will never forget. But this tour is more than a Chimpanzee safari, this is a wonder-packed tour providing the opportunity to see all those other wonderful African creatures. It is also perfect for those wishing to do some varied activities as well as the more traditional driving safari. Variety is the spice of life and Tanzania, like our Kilimanjaro-Chimpanzee-Serengeti, has plenty of it! For more primate and equatorial forest safari packages. Karibu (means welcome) Tanzania! We hope you have a wonderful stay in one of East Africa’s gems. Home to Mt. 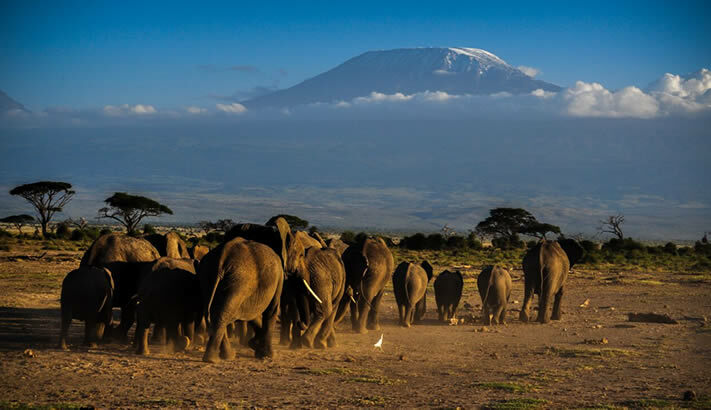 Kilimanjaro, the Serengeti, and Zanzibar, Tanzania covers an area of 365,756 square miles and is home to approximately 51.82 million people. Tanzania was formerly known to the world as Tanganyika before it became an independent state (from the United Kingdom) in 1961. The merger of Tanganyika and Zanzibar in 1964 called for a new name thus Tanzania was born. While Kiswahili is the official language of Tanzania, the country consists of an estimated 125 ethnic groups, including Chagga, Maasai, and Sukuma. About a third of country practices Islam, another third practice Christianity and the last third practices their own indigenous beliefs. How is it possible that people with such a diverse linguistic, cultural and religious backgrounds can live relatively peacefully among each other? This is one of the most beautiful puzzles of Tanzania and many people continue to try to answer. What will you discover during your stay here? Set out on Kilimanjaro-Chimpanzee-Serengeti to experience the wild wonders of Tanzania from the unique perspective of the people who call it home. Settle into Maasai country, getting to know the culture and hiking the Ngorongoro Highlands, Olduvai Gorge, and the Great Plains. Complement your walking adventures with game drives in some of East Africa’s most wildlife-rich areas: the Ngorongoro Crater and the legendary Serengeti. Final, lie down and enjoy the cool breeze in the palm white sand beach of Zanzibar archipelagoes. Would you like to fly over luxury safari? Most of Tanzania Safari start with landing at Kilimanjaro airport. Once you land and pass through immigration, you will meet l Mundo Safari representer and transferred to the lodge. Your journey would have been a long one so take this opportunity to get as much rest as possible. Dinner and overnight at Simba Farm or similar. Wake up for early morning breakfast with a view of the great Mt Kilimanjaro (weather permitting). You can either relax here for the day or embark on a day hike to the first climbing point of West Kilimanjaro. The hike is approximately 4-5 hours ascent, where you will rest for lunch and 2 hours descent. You will be collected in the morning and driven to Tarangire National Park and your first safari day! This incredible Tanzanian reserve, supported by the Tarangire River, offers spectacular natural beauty and outstanding diversity. While there is an abundance of resident wildlife throughout the year, the best season for migratory wildlife is August to October. Come and watch herds of African elephants and spot other big game against a backdrop of beautiful savannah characterized by the archetypal African baobab trees. An exhilarating driving safari awaits you here! In the evening you will have the option of an additional night drive. Enjoy your relaxed evening and dinner at Nimal Africa Tented Camp or similar. If you still have an appetite for more Tarangire wonders, you can take in an early morning game drive, or drive straight to Lake Manyara National park. You will discuss with your driver guide for the best options. With its tropical forest-like environment, Lake Manyara offers a very distinctive landscape compared with the other national parks. It also boasts a huge array of birds, as well as large groups of baboons and elephants. In the afternoon, we will enjoy mountain biking in the area and later in the evening, there is another additional Night Game drive option. Another morning game drive or a leisurely morning at your accommodation is your choice this morning. We commence the drive to the Central Serengeti at 13:00-14:00. Enjoying everything the Central Serengeti has to offer, you will today embark on an incredible driving safari of the famous ‘endless plains’. Here the big cats roam and the migration takes place all year round, affording you the chance to be among more than 1 million journeying wildebeest and zebra. As you will be staying inside the park, you will be able to cruise through the Serengeti plains until the famous African sunset transforms the wildlife and landscapes into silhouettes against a magnificent and dazzling orange sky. For your first morning in the Central Serengeti, we would recommend a wake-up call of 05:30-06:00 for a spectacular sunrise game drive with a breakfast box. Alternatively, you can enjoy a hot breakfast back at your camp/lodge before a morning game drive. The remainder of the day will be spent exploring the many wonderful sights of the Serengeti. Enjoy sundown a cocktail at Nyumbani Tented Camp. If you have not already done so, today is another opportunity for the sunrise safari in the Serengeti before we head to Ngorongoro Park (2.5 – 3hr drive) home to one of the world’s most renowned natural wonders, the. Ngorongoro Crater. There is the added option of a Guided Walk to the Crater’s rim or a Nature Walk. (* Please note that this is an additional activity and charge. Please let us know if you would like to do this and we will make arrangements.) Overnight will be at accommodation outside of the reserve. We would recommend arriving at the Ngorongoro gate by 6 am. Upon your first glimpse, you will be in awe of the world’s largest unbroken caldera. Not only this an abundant variety of animals share this vast paradise – about 30,000 in numbers. It is also reputed to be one of the best places to view the big 5! By 2 pm will we start the drive back to Arusha and take you to your hotel for some well-earned rest. Driving Time: 3.5 – 4 hours. Upon arrival, a representative from your accommodation in Mahale will collect you at the airstrip and transfer you to your hotel. In the afternoon you start your exploration of Mahale Mountains National Park. This fascinating jungle environment, a remote and mesmerizing place of 1,613 sq kilometers, is home to some of Africa’s last remaining wild chimpanzees. It is also famed for red colobus, red-tailed and blue monkeys, and a diverse variety of forest birds. DAY 10 & 11: Mahale National Park. Enjoy an awesome two days in this incredible corner of the world partaking in the activities of your choice as previously listed. Today you will be transferred from your accommodation to the airstrip to connect with your flight back to Arusha. Upon arrival, you will be collected and taken to your hotel in Arusha. Driving Time: 45mins – 1 hour. Contact us to customize this tour. See also our Fly Safari Package.